If you’re looking for the most physique-changing exercise in existence, you would arguably be looking at the squat. The squat builds lean muscle on your upper and lower body, burns fat and cranks your metabolism up to that which resembles a champion race horse! It’s not just limited to trainee’s in the gym – Most qualified trainers are also providing gym users with incorrect and outdated information when it comes teaching their clients how to squat correctly! Today I want to look at 3 myths which surround squat technique and correct them for you so that you are not only squatting correctly, but effectively for maximum results! I want you to look at your knee’s the next time you’re walking up a flight of stairs..Take a look at your knee when you step up on a kerb..Maybe take a look down when you next get up off of your chair. You’ll very likely see that your knee’s travel slightly past your toes – This happens naturally and is FUNCTIONAL! But what’s the first thing most trainers tell you when squatting? Although their safety is your priority, they are potentially making the exercise far more dangerous for you – How? Well if your knee’s aren’t travelling slightly past your toes, you’ll need to lean forwards at the hips. This increases the pressure on your lower back by up to 300%!! Now imagine this with a 100kg barbell on your back..What about 140kg? 180kg (400lbs)? You’re asking for trouble – Once your lower back goes, you’re out of the gym. There are no work-arounds. The bottom line – Protect your lower back at all costs! You’re also using your glutes for the movement predominantly when you don’t allow your knee’s to travel past your toes. Allowing your knee’s to travel slightly forwards will allow your quads to fire into the movement too. “Won’t this hurt my knee’s?” – Ok, you are adding around 60% more pressure on your knee’s when using this technique – However, 60% more pressure on the knee’s VS 300% on the back is a much better compromise, trust me. Your knee’s will be able to handle the weight but everybody’s threshold will be different. I started using knee-wraps when I started squatting above 140kg (315lbs), Just as a preventative measure. My knees feel absolutely fine! If you’re worried about your knee’s, then wrap them up from the very start and don’t squat too deep. So what should the squat look like? Very simply, at the bottom of the movement your shins and upper body should be parallel with each other (like in the picture to the right – By the way, I’m wearing totally the wrong footwear here as I just decided to film impromptu that day – Your footwear should be flat i.e. converse or even bare feet). Remember, we are only talking about your knees travelling VERY SLIGHTLY past your toes to make the movement more natural! DON’T make the movement dangerous by taking your knee’s or your back too far forward! This one might surprise many of you but don’t misunderstand me – I’m not telling you to come up on your toes either, that’s asking for trouble and will likely be a result of your knee’s travelling too far forward or tight calf muscles. What I am saying though is to push your weight evenly through the heel and the balls of your feet to ensure all of your muscles are firing properly and to maintain the technique I just recommended in Myth Number 1. If you put all of your weight into your heels, your technique will most likely be back to where your knee’s don’t move past your toes and your back leans too far forward. This is another mistake nearly all personal trainers use to teach their clients how to do squats. The next time you squat, get a feel for how the pressure is distributed in your feet and keep it even. 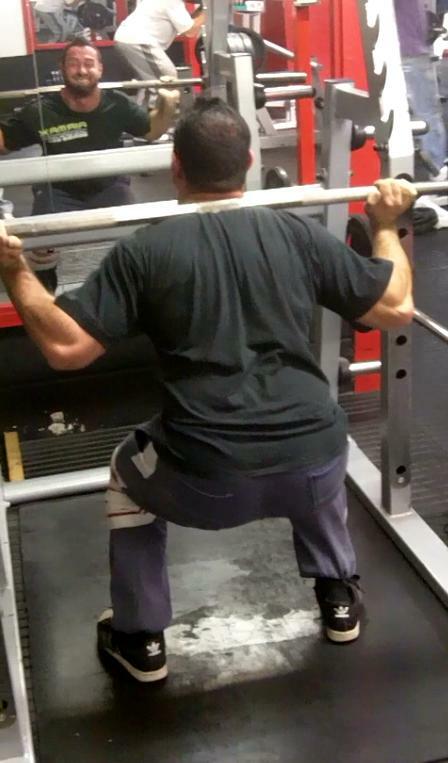 Another thing trainers teach incorrectly in my opinion is the depth of a squat – This advice goes hand-in-hand with MYTH NUMBER 1 – If your knee’s don’t travel slightly past your toes it becomes very hard to squat deeper than 90 degree’s..and if you can get deeper than 90 using that incorrect technique, I don’t even want to imagine what your lumbar spine is going through! I don’t have a particular angle that you should aim for – It is all relative to your experience, flexibility, strength, current condition etc etc. There are too many variables for a one size fits all recommendation in this area. 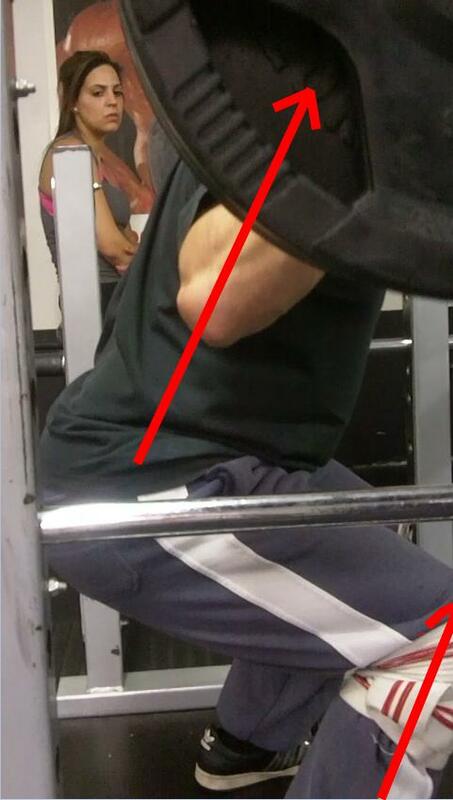 I go slightly below a 90 degree angle but with increased flexibility in my calf’s I could squat deeper. Everybody will have their reasons as to why they squat the depth that they do but you should be squatting until you have at least a 90 degree angle in your knee’s or yo hamstrings are parallel to the floor if your goal is to build muscle or burn fat. There you have it – With these 3 myths busted, you should find your squat becoming stronger, safer and far more effective! Perform them incorrectly and squats can become your enemy – Perform the squat with correct technique and squats are the bestest friend you’ll ever have when you look at your new body staring back at you in the mirror! Your knee’s should not bow in or widen out when you squat. If they are, you need to strengthen/stretch the effected muscles. Control and slowly lower yourself into the squat but explode up faster on the positive portion of the movement. A belt is optional – I find them irritating and my core seems to be strong enough to handle the weights I’m moving at the moment. Knee wraps are a neccesity in my opinion – Even if your knee’s don’t hurt, it’s better to have the wraps there and not need them, than to need them and not have them there. Squats should be an exercise where you lift the heaviest and challenge yourself (once form is correct) so the protection helps. Have your toes pointing slightly out when you squat – Between 15 to 30 degrees out is a good angle. Make sure your knees follow the same line that your toes are pointing in. Be sure to leave your comments below! and don’t forget to check out my FREE Transformation Workout Program HERE if you haven’t downloaded it already.